In typography, emphasis is the exaggeration of words in a text with a font in a different style from the rest of the text—to emphasize them. It is the equivalent of prosodic stress in speech. For other uses, see Bold (disambiguation). The most common methods in Western typography fall under the general technique of emphasis through a change or modification of font: italics, boldface and small caps. Other methods include the alteration of letter case and spacing as well as color and additional graphic marks. The human eye is very receptive to differences in brightness within a text body. Therefore, one can differentiate between types of emphasis according to whether the emphasis changes the “blackness” of text. A means of emphasis that does not have much effect on “blackness” is the use of italics, where the text is written in a script style, or the use of oblique, where the vertical orientation of all letters is slanted to the left or right. With one or the other of these techniques (usually only one is available for any typeface), words can be highlighted without making them stand out much from the rest of the text (inconspicuous stressing). This was used for marking passages that have a different context, such as words from foreign languages, book titles, and the like. By contrast, an emboldened font weight makes text darker than the surrounding text. With this technique, the emphasized text strongly stands out from the rest; it should therefore be used to highlight certain keywords that are important to the subject of the text, for easy visual scanning of text. For example, printed dictionaries often use boldface for their keywords, and the names of entries can conventionally be marked in bold. If the publisher prefers not to use bold, or has already used it for another purpose, a second form of emphasis can be introduced by using a lightface or thin version of the main text font, although this is not very common. Capitalization is used much less commonly today by British publishers, and usually only for book titles. All-uppercase letters are a common form of emphasis where the medium lacks support for boldface, such as old typewriters, plain-text email, SMS and other text-messaging systems. Culturally all-caps text has become an indication of shouting, for example when quoting speech. It was also once often used by American lawyers to indicate important points in a legal text. While the practice, dating to the use of typewriters, became unnecessary with the arrival of computerised text formatting, it is still sometimes seen, especially in documents created by older lawyers. An example of sperrsatz. Note wider spacing of the word gesperrt (“letterspaced”). 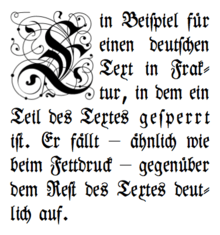 Since blackletter type remained in use in German speaking parts of Europe much longer than anywhere else, the custom of letterspacing is sometimes seen as specific to German, although it has been used with other languages, including English. Especially in German, however, this kind of emphasis may also be used within modern type, e.g. where italics already serve another semantic purpose (as in linguistics) and where no further means of emphasis (e.g. small caps) are easily available or feasible. Its professional use today is very limited in German. In Chinese, emphasis in body text is supposed to be indicated by using an "emphasis mark" (着重號), which is a dot placed under each character to be emphasized. This is still taught in schools but in practice it is not usually done, probably due to the difficulty of doing this using most computer software. Consequently, methods used for emphasis in Western text are often used instead, even though they are considered inappropriate for Chinese (for example, the use of underlining or setting text in oblique type). In Korean texts, a dot is placed above each hangul syllable block or hanja to be emphasized. Important words in a text may be colored differently from others. 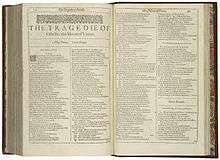 For example, many dictionaries use a different color for headwords, and some religious texts color the words of deities red, commonly referred to as rubric. In Ethiopic script, red is used analogously to italics in Latin text. With both italics and boldface, the emphasis is correctly achieved by swapping into a different font of the same family; for example by replacing body text in Arial with its bold or italic style. Professional typographic systems, including most modern computers, would therefore not simply tilt letters to the right to achieve italics (that is instead referred to as slanting or oblique), print them twice or darker for boldface, or scale majuscules to the height of middle-chamber minuscules (like x and o) for small-caps, but instead use entirely different typefaces that achieve the effect. The letter ‘w’, for example, looks quite different in italic compared to upright. Linguistics professor Larry Trask stated that "It is possible to write an entire word or phrase in capital letters in order to emphasize it", but adds that "On the whole, though, it is preferable to express emphasis, not with capital letters, but with italics." ↑ This technique may also be used to 'deemphasise' text, as in the "Concordant Literal (Bible)" (OT, ISBN 0910424098; NT, ISBN 0910424144): "The type is large and readable, with boldface representing the actual English translation of the original Hebrew and Greek and lightface showing English words added for idiomatic clarity or to reflect grammatical significance." ↑ "Why is your Contract YELLING AT YOU? All Caps in Contracts, Explained.". Shake Law. Retrieved 29 July 2015. ↑ Garner, Bryan A. (2013). Legal writing in plain English : a text with exercises (Second edition. ed.). University of Chicago Press. ISBN 978-0226283937. Retrieved 2 August 2015. ↑ An example of an English translation of Russian original, with a non-typewriter font (i.e. variable-width letters) is in Eigeles, M. A., Kinetics of adhesion of mineral particles to air bubbles in flotation suspensions, Comptes Rendus (Doklady) de l'Académie des sciences de l'URSS, XXXIV(4), 340–344, 1939. ↑ Example: Schäfer EA, Canney EL, Tunstall JO. On the rhythm of muscular response to volitional impulses in man. The Journal of Physiology 1886;VII(2):111–117. ↑ Charette, François (2010). "ArabXeTeX: an ArabTeX-like interface for typesetting languages in Arabic script with XeLaTeX" (PDF). ↑ Hudson, John (2003). "RED, WHITE & BLACK True colors?". ↑ Trask, Larry (1997). "Capital Letters". Look up boldface or Appendix:Boldface in Wiktionary, the free dictionary.